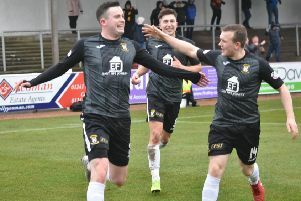 East Fife host a Brechin City side battling against the drop on Saturday before welcoming Kingdom rivals Raith Rovers seven days later. A full point haul will all but confirm East Fife’s place inside the top four and defender Dunlop wants it settled sooner rather than later. He said: “Home games are very important in the run in. “We have Brechin next and will take each game as it comes. “It’s an old cliché but is so true at this stage of the season because you can’t be looking to games beyond the next one. “You’ll end up slipping up and losing or drawing. “It’s a huge game because with us losing to Arbroath it keeps that door open for the teams coming behind us, like Dumbarton, Airdrie and Montrose. 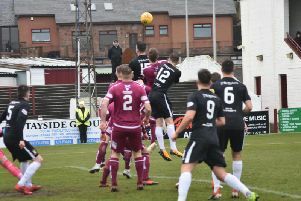 The Fifers left Gayfield disappointed not to leave with something to show for their efforts. But with the likes of Anton Dowds returning from illness, and Scott Agnew from injury, Dunlop reckons the squad can peak at a crucial time. “We have a good squad which you’ve seen over the past few weeks,” he said. “We’ve played a lot of games so have had to have that squad. “We’ve picked up points but there are games we know we could have done better in.